The weather has been all over the board this year. Too much rain earlier this summer and then a very dry end of summer. Crops really don't like this. 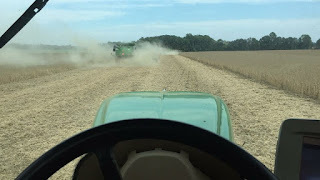 A lot of crops weren't able to be planted until later than usual this year, so that may push back harvest in some areas. There are lots of varieties of crops and various maturity lengths, too. Some shorter maturity beans are ready to be harvested now. The view from inside the combine of the tractor and grain cart. 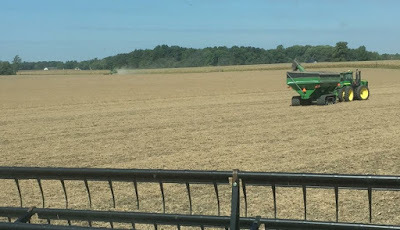 The soybeans initially go into the combine and then are dumped into the grain cart in the field. What does this mean for you? It means that you may encounter a few more traffic jams on those scenic country roads. My best advice is to give yourself a few more minutes than you think you need to get somewhere so you can sit back and enjoy the scenery rather than stress out about being late. Soybeans are important to dairy cows, too. Soybeans are processed into lots of things, one of them being soybean meal, which is a great source of protein for cows. 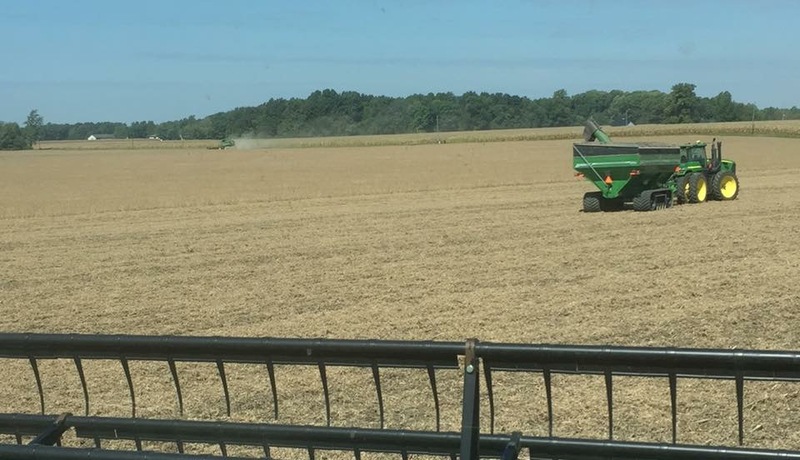 We don't grow soybeans in Washington, so I had never seen a soybean plant until I moved to Indiana. Most dairies out there feed soybean meal in their TMR (total mixed ration...a casserole of various ingredients that are mixed together and fed to dairy cows), so I was familiar with that. Since most livestock farmers in Indiana are also crop farmers, I've been learning a lot about corn and soybeans since moving here. Still not an expert, but I have learned a thing or two.